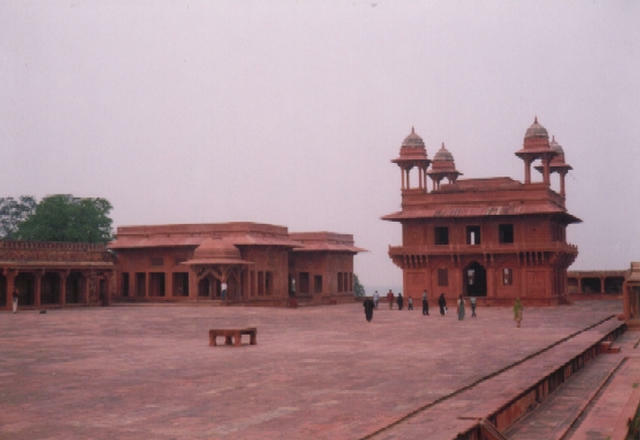 Chaupar (also known as Chaupad, Chaupur, Chaupat, Chausar, or Pat in Sanskrit). 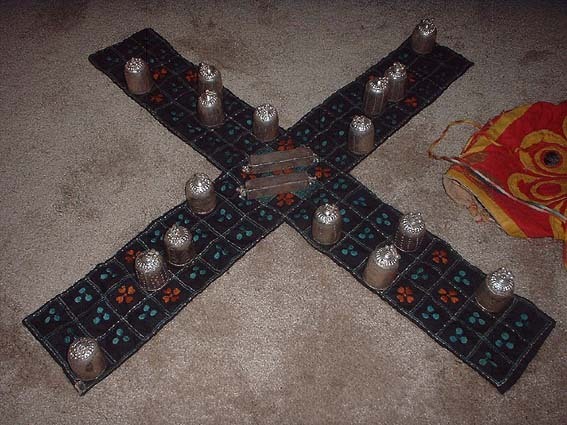 Chaupar is a cruciform board game played with quaternary lots in the form of long dice. The board is made of wool or cloth. The pawns are made of wood. It is difficult to separate it's history from the related board game Pachisi who most probably is either a descendant of Chaupar or developed alongside Chaupar in the same timeframe. It is believed that both games were created around the 4th century A.D.
Chaupar is more complex than Pachisi and was regarded as the more aristocratic game. Today both Chaupar and Pachisi are regarded as trivial pastime games. Folk game. Chaupar's Golden Age seems to have been during the Mogul Dynasty (1526-1857). 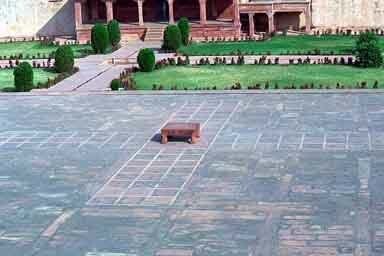 There are large boards marked out with inlaid marble and red and white squares on palace courtyards at Allahabad and Agra which served as giant Chaupar boards. The Emperor Akbar I (1542-1605) played Chaupar directing from a central dais. His pawns were sixteen slave-girls from his harem dressed in the traditional four colours of the pieces. Chaupar (and Pachisi) might be ancient and very old games. But nothing is certain about it's age. Chaupar was believed to very old by the Mogul historians, but there is no firm evidence of it's claimed antiquity1. Partnership game2. Black and yellow oppose red and green. Movement decided by throwing of two long dice marked 1-3-4-6; or three dices marked 1-2-5-6. Regular starting points are 6-7-23-24 spaces from the char-koni. Another starting point can be 6-7-9-10 from the centre, and thus at the end of each player's home arm. Captured pieces re-enters from either it's start position or from the char-koni. An exact throw is required to get home (homing). No value of the dice will gain an extra turn. There are no safe squares. The pawns do not get out from the Charkoni (nest) square, but from the 6, 7, 23, and 24 positions. Pawns can be converted into "super pawns". If 2 or more from the same player are placed in the same square, they can move as a single pawn and can only be eaten by another super pawn. Forfeiting the turn voluntarily is not allowed (unlike Pachisi). 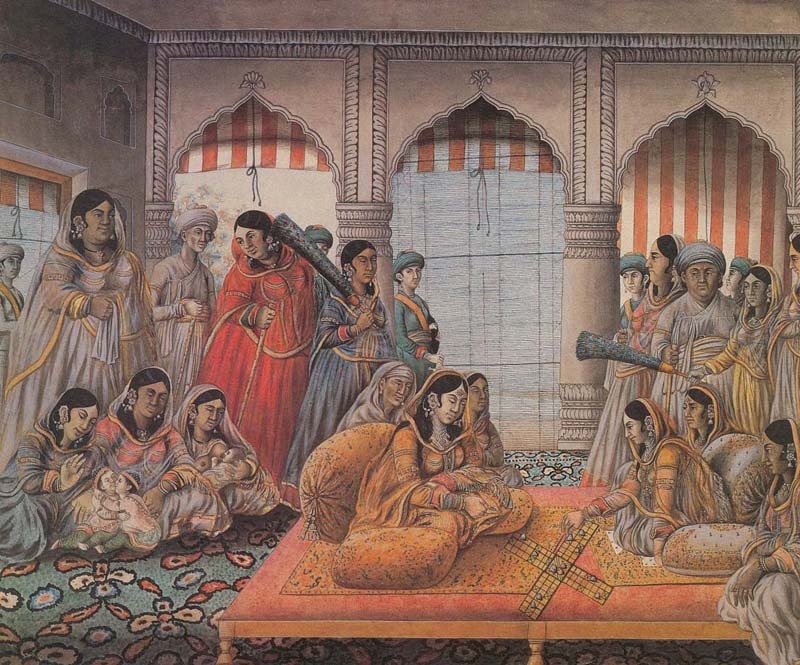 Senior wives playing Chaupar (Lucknow, c.1790). 1. Parlett, 1999 pg. 43. Parlett says: "A first-millennium origin for Pachisi or Chaupar seems plausible". 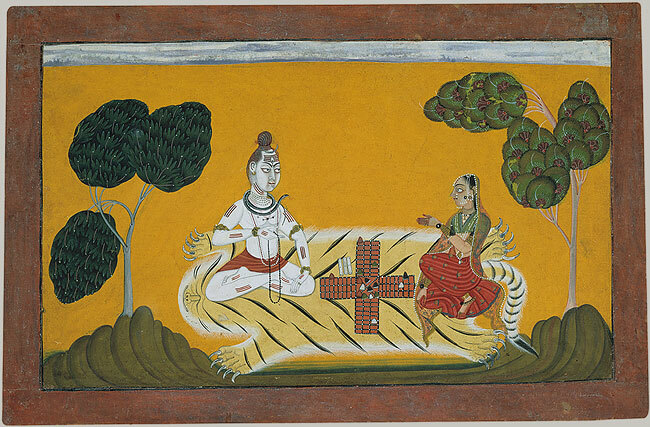 "The earliest claimed representation of Chaupar is the carving of Shiva and Parvati at in the cave temples of Ellora, specifically in cave 21, whose carvings date from the late sixth or early seventh century; but only the dice can bee seen - there is no sign of a suitable board." 1. (continued) - An indication of Chaupar (or Pachisi) as an ancient Hindu game is noted in Irving Finkel's 2002 article: "Pachisi in Arab Garb". A variant of Pachisi called Pachiz is played in Khorezm in Uzbekhistan. It is clear that Pachiz was introduced from India - the evidence is among others the use of the Hindu terminology and the use of cowrie shells as dice. The archeological finding of similar cowrie shells have been attributed to about the 1st-3rd centuries AD. This is the the period when India exerted great influence on Khorezm (as part of the Kushan Empire). Note that Finkel defines Pachisi as the general term for all Asian race games played on a cruciform board. 2. But could also be played by only two (several images supports this), perhaps with "dummy partnerships" (Saunders, 1999, 26, p. 569-570).